Another thing that I love about summer besides grilling, is the abundance of local neighborhood farmers markets that sprout throughout the city. Search here to find the market closest to you. In the past few weeks Capitol Hill and Wallingford have ushered theirs in, while Queen Anne and a few other start up in June. I love farmers markets for what they are; a chance to get great stuff from our local neighbors, support the community, and best of all, be outside! What’s great about all the farmer’s markets around town is that each of Seattle’s distinct neighborhoods have their own. Live in Columbia City? You’re good. Phinney Ridge? Of course. Magnolia? Another reason to never leave your enclave. They roll throughout the summer and you’ll pretty much be able to go to a farmer’s market every day of the week at almost every hour of the day. Don’t believe you could get fresh local produce from a farmer at 11am on a Tuesday? 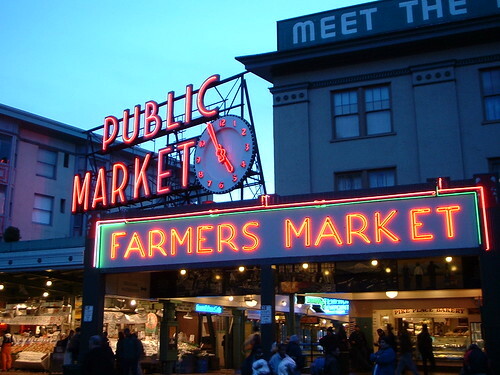 Go to Pike Place Market. I also love farmers markets because they truly enrich our area. Of course they are local businesses, but they also help support our local restaurants, cafes, and grocery stores. Farmers markets are pretty much the farm’s retail face. A great chance for them to showcase their goods to us, but they also supplement a large part of their income by providing produce, cheese, meats, etc to our local restaurants and food shops. The food scene around town is very insular and circular; everyone pretty much helps out everyone else, and I love it! That’s why I like going to these markets; I always feel that I’m part of something bigger, all for the quest of good food. As a Husky, I’ll always hold anything that is associated with the U-District close to my heart. Too bad the market has nothing related to UDubb outside of proximity. Whatever, I love the University District Farmers Market for a bunch of reasons; because it’s sprawling, you can get Heath Putnam’s Mangalitsa pork, maybe run into a local chef (bumped into Boat Street Cafe’s Renee Erickson several times), and get everything within a couple hundred mile radius of Seattle. As part of the U-District, the parking is abundant and mass transit is readily available. It’s in a parking lot on the NW corner of 5oth and University. This farmer’s market is on Saturday from 9am-2pm. Love the early hours. I have two favorite memories from the West Seattle’s farmers market. One, is with Patrick of Stoney Plains farms. When we went last summer, he had a corner spot for his farm’s produce. His personality and ability to converse with customers were a winning combination. He invited us to try everything to provide an idea of the flavor. I loved this about him, he brought something to an easy level and made buying vegetables fun. My other memory is of the knife sharpener. I wish I caught his name, but he had a small little table where he just sharpened knives. Nice, polite, and made getting my knives sharpened an event. It was exciting to have him work on them! And it was a deal! Two chef’s knives and a paring knife for sharpened for $10! Deal! These are but two of the stories I have from this market. Stop by on Sunday from 10-2 and carve out your own memories. Bear in mind that the market is a short little block from residences, so be respectful and mindful of parking. And be a little jealous that the neighbors have such a great market in a cool part of town right outside their doors. We visit the Ballard’s Farmers Market the most because of the proximity. It’s pretty much just down the hill from us. So in more motivated days we could ride our bikes there. However, we’re not always that athletically inclined. We go pretty much every weekend and always come out with a bag full of stuff. It could be produce, cheese from Golden Glen Creamery, meats, or some mushrooms and other stuff from the Foraged & Found crew. We also like this market, because our friend Janna sells her Secret Stash Salts at this market. It’s always nice to stop by her booth, catch up and see what funky cool salts her and chef Joseph Conrad have concocted. My favorite of the moment is the Vanilla Salt. I love to bake and sprinkle this over most anything; cookies, rice crispy treats, whatev. Be sure to stop by her table and sample all of their salts. It’s not just the friends we’ve made at the Ballard Market, it’s also the environment. We love that people come out in droves. We love all of the dogs that are with their owners (it makes us want to get a dog; she wants a Great Dane, I want a Golden Retriever). We love the curiousity and excitement that flow. Most everything about the Ballard Farmers Market we truly enjoy. Parking is a bit tricky, so be patient and a walk may be in order. Thankfully Ballard is one of the more vibrant neighborhoods we have so there is always something to do there. The market’s hours are from 10-3pm on Sunday. See you there. There you have a quick rundown on a few of my favorite farmers markets. And to get the most out of your market, here are 10 tips to guide your experience. A goal for this summer is to visit a few of the others around town, taking in some of the best that our city and state can provide. See you around the market table.